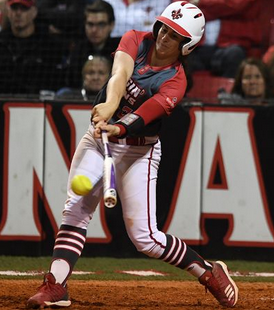 LAFAYETTE – With a 2-0, 4-2 doubleheader sweep of UT Arlington on Saturday at Yvette Girouard Field at Lamson Park the 10th-ranked Louisiana Ragin’ Cajuns Softball team continued its undefeated run in Sun Belt Conference play. Louisiana (33-4, 15-0 Sun Belt) also stretched its current win streak to 10 games and extended its streak of consecutive Sun Belt series won to 51 dating back to March 2013. Summer Ellyson’s sixth complete game shutout of the season highlighted Game 1 and clinched the series for the Ragin’ Cajuns. Kara Gremillion made the Mavericks (18-21, 6-9 Sun Belt) pay for a leadoff walk in the second inning as she delivered the run-scoring hit which provided the lead. Back-to-back clutch two-out hits by Lexie Comeaux and Kourtney Gremillion in the fourth inning of Game 2 snapped a 2-all tie. Comeaux singled through the left side for the go-ahead tally and Gremillion doubled her home for an insurance run. Carrie Boswell held UTA in check over the first four innings, then Ellyson shut the door with three scoreless frames for the save. Bailey Curry, who drew two walks in the contest, had the critical leadoff walk in the second inning. Comeaux executed the sacrifice bunt to place pinch runner Alaina Guarino in scoring position. Alissa Dalton extended her hitting streak to 12 games and gave Ellyson an extra run to work with by looping an RBI single into right center in the fifth inning. Ellyson (23-4, 1.18 ERA) scattered three hits and threw only 74 pitches in capturing her nation-leading 23rd victory. She never faced more than one extra batting in a single inning. Sarah Hudek picked up her team-leading third RBI of the series when her two-out triple opened the scoring in the first inning. Kara Gremillion scored the first of her game-high two runs in the second inning, pulling Louisiana into a 2-all tie, after she led off with an infield single and later scored on a Laura Henriksen wild pitch. Comeaux’s heroics in the fourth inning came in a pinch-hit situation and was set up by a sacrifice bunt from Raina O’Neal. Keeli Milligan finished 2-for-3 at the plate, giving her at least one base hit each game of the series. Boswell bounced back from the Mavericks’ two-spot in the second inning by retiring the visitors in order the next two frames to set up Ellyson’s save. With the two more scoreless outings, Summer Ellyson’s final line has included one run or fewer in 23 of 30 appearances. Summer Ellyson worked 17 innings vs. UTA, picking up two wins and a save. She surrendered only one run, yielded just eight hits and held the Mavericks to a .148 average. Through five weeks of Sun Belt play, Summer Ellyson has recorded an 11-0 mark and yielded only eight runs and 36 hits over 69-2/3 innings pitched. The Game 1 victory allowed Summer Ellyson to match her career-high total of 23 set during the 2018 season (went 23-10). Over the past 55 innings pitched the Louisiana pitching staff has allowed only four earned runs. During the stretch the staff sports a 0.51 ERA and has held foes to a .116 average. Alissa Dalton’s hit streak closed at 12 games, leaving her two shy of her career-best streak of 14 game recorded in 2018. The Ragin’ Cajuns out-hit the Mavericks all three games of the series. Louisiana has held the advantage in hits 32 times out of 37 games this season. Kara Gremillion, Bailey Curry and Keeli Milligan finished tied for the team lead with four hits in the series. Seven players total picked up multiple hits over the weekend. Louisiana increased its all-time series lead over UT Arlington to 29-6. The Ragin’ Cajuns advantage in the Sun Belt era (2014-present) now stands at 16-2. No. 10 Louisiana concludes its current four-game homestand on Wednesday, April 10 vs. Southeastern Louisiana. First pitch is set for 6 p.m. at Yvette Girouard Field at Lamson Park.